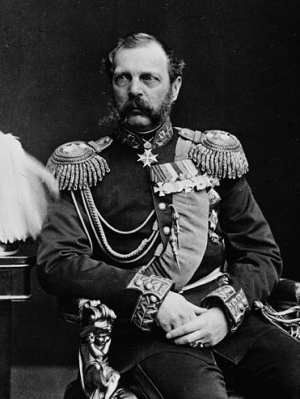 Alexander II: Emperor of Russia from 1855 to 1881; born 29 April 1818, the son of Nicholas I and Charlotte of Prussia and nephew of Alexander I. Alexander married Marie of Hesse (1824-1880) who became known as Maria Alexandrovna. He was assassinated on 13 March 1881 in St. Petersburg and was succeeded by his son Alexander III. Alexander was very favorable to the Mennonites and confirmed their charter of privileges. For their faithful (nonmilitary) service in the Ukrainian war (1854) and the Turkish war (1877) he presented the Mennonites of Chortitza with a handwritten document expressing his royal thanks. To the Mennonites of the Molotschna he expressed his good wishes "for the praiseworthy manner in their quartering and feeding of six thousand immigrant Bulgarians." Significant was the position of the Tsar on the question of the bearing of arms (1871-1874), when the Mennonites were to be drafted into armed service upon the passing of the law of universal conscription. He sent his adjutant, Count Totleben, into the colony to prevent their immigration to America, and granted their request for freedom from military service on the condition that their young men of military age serve in the forestry (Forsteidienst). Hege, Christian and Christian Neff. Mennonitisches Lexikon, 4 vols. Frankfurt & Weierhof: Hege; Karlsruhe: Schneider, 1913-1967: v. I, 21. Neff, Christian. "Alexander II, Emperor of Russia (1818-1881)." Global Anabaptist Mennonite Encyclopedia Online. December 2007. Web. 24 Apr 2019. http://gameo.org/index.php?title=Alexander_II,_Emperor_of_Russia_(1818-1881)&oldid=144690. Neff, Christian. (December 2007). Alexander II, Emperor of Russia (1818-1881). Global Anabaptist Mennonite Encyclopedia Online. Retrieved 24 April 2019, from http://gameo.org/index.php?title=Alexander_II,_Emperor_of_Russia_(1818-1881)&oldid=144690. Adapted by permission of Herald Press, Harrisonburg, Virginia, from Mennonite Encyclopedia, Vol. 1, p. 44. All rights reserved.